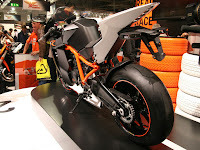 The 2009 KTM 1190 RC8 R. Awesome! 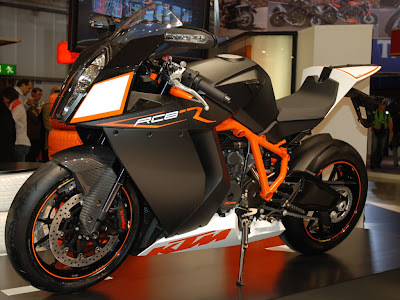 The KTM RC8 was already the most impressive all-new litre-class superbike launched in recent years, and for 2009, KTM have upped the ante with a higher performance version – the 1190 RC8 R – which is now being shown at the EICMA in Milan. With its new Keihin engine management system, the RC8 R’s 1195cc v-twin has been tweaked to produce 165bhp at 10,250rpm and 123Nm of torque at 8,000rpm. And for those who want still more, KTM are offering an optional racing kit that’ll boost power to 180bhp. With its new orange-black-and-white paintjob, high-spec fully adjustable WP suspension, Brembo brakes and lightweight cast aluminium wheels, the RC8 R weighs 183kg dry, and looks flat out fantastic. With the KTM 1190 RC8 R joining the Ducati 1198, BMW S1000RR and Aprilia RSV4 in World Superbikes next year, things look all set to get very interesting in 2009…!